Forget coffee. Forget juice. Forget milk, damnit. 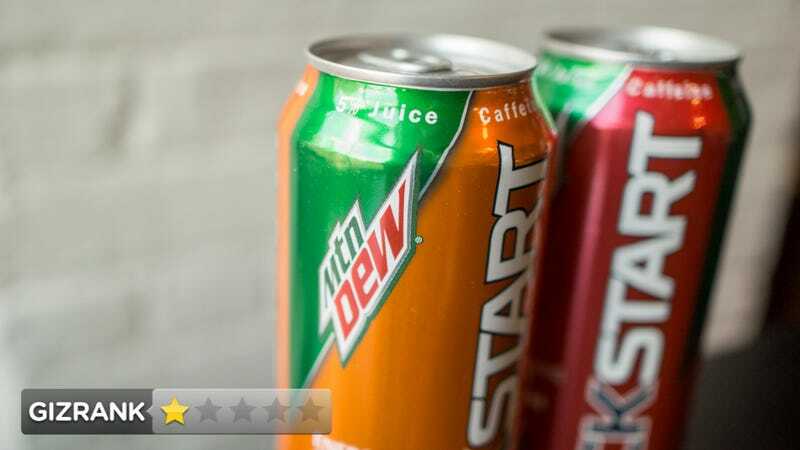 Mountain Dew wants you wash down your Wheaties with an energy drink. Nope. Nope. Nope. We're not going to do that. An energy drink you imbibe before noon with 5 percent juice, vitamins A and B, 180mg of sodium, 95mg of caffeine, and absolutely zero real nutritional value. It comes in Energizing Orange Citrus and Energizing Fruit Punch With Just The Right Amount Of Kick. People who don't want to drink coffee or tea, wonder what pairs well with a 7-11 Maple Pancake Sausage Roller, want to kick and punch their way into the office. And sell weed on the side. A 6.25-inch tall orange and green/red and green aluminum can filled with poison. It came to us already chilled in a thick plexiglass case because it is radioactive. Orange tastes like Diet Sunkist and Fruit Punch has notes of Mountain Dew Code Red. It makes you very awake but not so awake that you're jittery or need to smoke a cigarette and it leaves a thick viscous aftertaste of a soft drink in the back of your throat. Five percent real juice is five percent more juice than you would think. It's an energy drink that you eat for breakfast. An executive had to approve this. It actually has less caffeine than an 8 ounce cup of coffee, which generally has around 100mg of caffeine. This is unquestionably bad for you and it's basically just regular Mountain Dew with different marketing. No. Are you serious? No. Already had one cup of coffee earlier. Did not finish the entire can(s) because I do not welcome death. My stomach kind of hurts but I'm not sure if that's from KickStart or the beer I drank last night. I would never ever ever ever ever ever ever ever ever ever ever ever ever ever ever ever ever ever ever drink this by choice.